Another Sega Genesis launch title, Super Thunder Blade is a poorly-executed port of a decent arcade shooter. 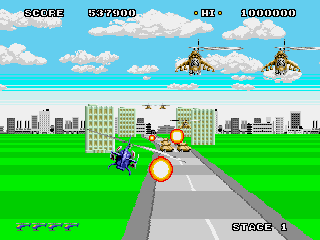 Combining both rail-style and vertically-scrolling levels, you pilot a helicopter while shooting at and avoiding fire from both air and ground-based enemies. While this may sound awesome in theory, the game loses it in the execution. The controls are sluggish and unresponsive, which appears to be an attempt by the designer to make the game feel more realistic. In the rail shooting sections (which are the meat-and-potatoes of the game), the explosions caused by your laying waste to waves of enemy tanks and choppers actually obscures your view of incoming fire, making it that much harder to dodge. In the vertically-scrolling areas, your helicopter is shooting almost straight down at the ground, so that you can’t kill anything until you’re almost on top of it. The graphics are detailed and colorful, but the game uses the same few sprites over and over, so that the presentation is just boring. Basically, the game is the exact opposite of Space Harrier II. In fact, the relationship between this game and Space Harrier II reminds me of Altered Beast and Last Battle. 2 games from the same genre available on launch day, with one being clearly superior to the other. All of that negativity aside, I do think the game has decent sound effects, and the music is very good. I actually have a hard time deciding whether this or Last Battle is the worst Genesis launch game. I could see playing Last Battle if I didn’t have anything else, but if this was the only game that I owned back then, I think I’d just go outside to play. Buy Super Thunder Blade on GameGavel or Amazon. Tagged genesis, Rail Shooter, Review, sega, Super Thunder Blade. Bookmark the permalink.